A sunroom usually called a glass or a screen room that is installed on top of a wood base or concrete foundation. It could have a different name such as solarium, patio room or patio enclosure. The sunroom is pretty much just a wall of glass that is used to bring in sunlight into the house. Another functionality of a sunroom is for protecting us from the outside such as rain, wind or any kind of insect such as bugs. Sunroom usually is composed mainly of single or double pane glass and it should be designed in a way that has to match the style of your house. Mico Construction has many years of experiences in sunroom additions. We can build many different styles of sunroom with an affordable budget. The best thing all about sunroom is that you can enjoy the surrounding environment comfortably. Most of our clients who have invested in a sunroom said that the sunroom is the favorite part of their house. It gives them a sense of relaxation and sunroom is easy to maintain and clean. Origin of sunroom and modern sunroom. In the old time, people used to have some kind of room similar to a porch where they can relax. But with the evolving of the window industry, we can buy a window that can withstand the storm and they attach the windows together and form an enclosed patio. Now a day, as there are more homeowners, people started to build more functional outdoor Fromm, and that how the sunroom was invented. 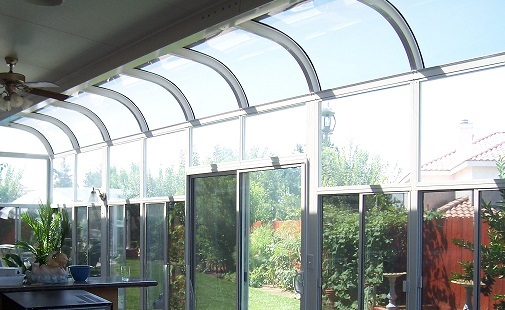 Choose a sunroom is easier than you would imagine. Mico Construction has many different types of sunroom design that you can choose to meet your needs. What is sunroom used for? The sunroom is best to use it as your patio and not worrying anything from the outside. ♦ Could also be used for works or exercise. Where to put your sunroom and how big should it be? First of all, you need to know what do you use your sunroom for and then decide a good size that will fit your purpose. For example, if you only use it for breakfast then you don’t need that of a big sunroom. The back of your house is a good place to build a sunroom because the patio usually stays on the back. There are other influences in choosing the location four yours sunroom, that is how much sunlight can get throughout the day. Knowing the materials will helps in selecting the right materials for your sunroom. sunroom has been invented for decades, but vinyl sunrooms have only been introduced lately and it costs a lot more and their choice of colors could be varied. The most important is how would you use the sunroom and what is the weather in the surrounding area. Vinyl is expensive because it is very efficient in thermal and it is also durable. Aluminum is also rigidity that provides good support for the structure. Reputable sunroom company usually have good referrals from old clients that have their sunroom built by that company. The best way is to see your favorite sunroom and as for the builder company. You can also search for them on the Internets and those that are on top of Google advertisement are often reputable. Once you have decided the company that you want to work with, you can contact them and make sure they have a free consult. Now you can go in details with them about your plans and ideas. Lower the costs are usually what people aim for but the quality is also important. You can request to see the previous sunrooms that they have built. A very important fact is that you need to make sure they are licensed and also ask them if they belong the home builder’s associations. Besides, you can also check with the Better Business Bureau (BBB) to make sure this company does not have many complaints from their old clients. Quality is important but the budget is, even more, to be reconsidered. Make sure this company have various styles and sizes of sunrooms that meet your desires. After installing your sunroom, the value of your house will surely increase and can help you sell your home quickly if you plan to. Manufacturer’s warranty is something that you need to make sure before moving any further in the building. Another importance is the Service warranty. This company that builds your sunroom should cover a warranty for your sunroom in case anything happens to it, at least for a couple of years.